With no service road at Old PB road and after the Chatrapati Shivaji Maharaj Railway Over Bridge has been made operational the businessmen and residents are facing a hard time to commute with no service road. 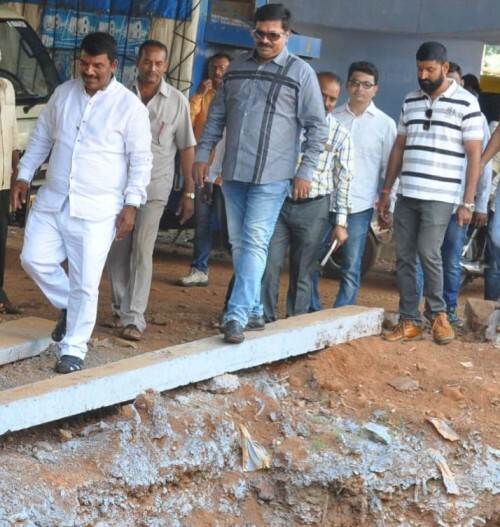 MLA Abhay Patil and Anil Benake both visited the site yesterday met with the locals and asked the officials to co-ordinate and complete the service road by June 10. Railway department, PWD, HESCOM,KUWS, Corporation, BSNL officials were directed by the MLA’s to see that the service road is ready before the rains and also let the cable, pipe work be done first and then the road be laid. Even with small showers the entire area is flooded with drainage water and hence it is very necessary to get this right before the rains. With respect to the over bridge near Gogte circle there has been some delay due lack of funds disbursement the contractors said.